Here's some good, good news. Microsoft is adding Google Talk (which all of you just call Gchat) support to Outlook.com. Meaning, you can use Google's chat service right through Microsoft's beautiful new(ish) webmail page. Awesome. 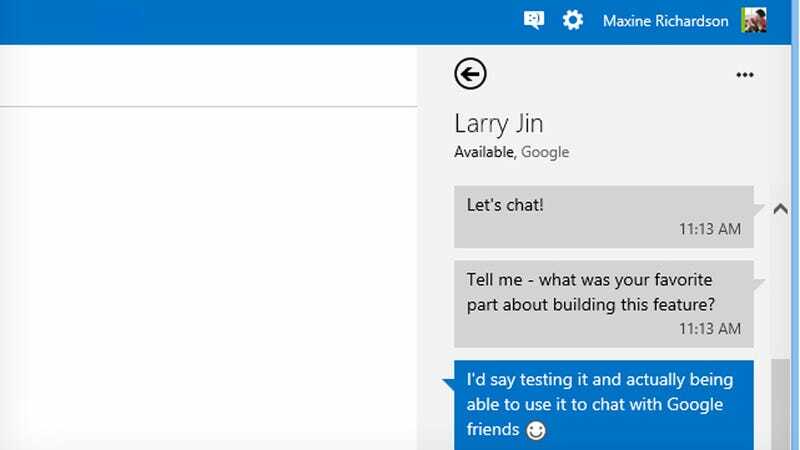 The addition of Google Talk chat (no video or voice) to Outlook is welcome news, since until now, Microsoft had been resistant to adding chat partners beyond Facebook and its own Messenger protocol (which recently brought Skype into the fold). It had been a big hindrance to Microsoft's efforts to integrate all your communication into unified hubs. Hopefully, this means Windows 8 and Windows Phone 8 won't be far behind with picking up Google Talk (Blue is just around the corner for both, after all), which would be a big step forward to finally getting chat right. For Google, the announcement comes just ahead of Google I/O, where it's expected to roll out a new communication initiative called Babel. Babel will reportedly bring all communication from Google (Talk, Hangouts, etc.) under one roof, and if it's partnering up with Microsoft on this, hey, maybe it'll go the extra mile in bring in outsiders like Messenger, Skype, and even standbys like AIM.